Gasoline (petrol in Commonwealth nations) is the most valuable product refined from oil. During the Pacific War, as today, it was used in the internal combustion engines powering ground vehicles and piston aircraft. It also saw use in PT boats and landing craft. Gasoline is refined from oil by fractional distillation, yielding a mixture of hydrocarbons containing around eight carbon atoms per molecule. This straight run gasoline rarely makes up more than a small fraction of the original oil, and so some of the heavier hydrocarbons in the oil are "cracked" at high temperature and pressure to produce additional gasoline. The use of catalysts (such as zeolite) to enhance the cracking process was just coming into use when war broke out in the Pacific. The quality of gasoline varies considerably. It is quantified by the octane number, which is a measure of the tendency of the gasoline vapor to ignite spontaneously when compressed. The higher the octane number, the less the tendency to predetonate, and the higher the compression ratio that can be used by engines fueled with the gasoline. Since a high compression ratio was essential to high performance piston aircraft engines, the development of very high octane gasoline went hand in hand with improvements in aircraft performance. Raising the octane rating from 70 to 95 allowed compression to be increased 65%, raising horsepower 40% while reducing fuel consumption by 25%. One of the benefits of catalytic cracking was that it produced a high-octane product. Octane numbers could also be enhanced with additives, such as tetraethyl lead (TEL). About a part per thousand by volume of TEL raised the octane number of ordinary gasoline enough to double the power output achievable with the piston engines of the Second World War. A small quantity of ethylene dibromide was also added along with the TEL to ensure that lead residues did not foul the engine. By 1930 the U.S. Army had issued a specification for 87 octane gasoline for aircraft engines. Test pilots Jimmy Doolittle, Edwin E. Aldrin and Frank D. Klein persuaded the Army to aim at 100 octane gasoline, and by 1938 the Army had adopted this new standard. By 1942 the Army was using a double performance number for gasoline quality, with 100/130 grade gasoline roughly corresponding to the old 100 octane standard. This gasoline was produced from basic 70 to 80 octane stock to which was added a blending agent that brought the rating to about 85 and TEL to raise it to 100. Most of the base stock (70%) was straight run gasoline blended with smaller quantities from catalytic cracking (20%) and hydrogenation (10%), while 95% of the blending agent was produced by alkylation and the rest by hydrogenation. The introduction of cumene (isopropylbenzene) allowed the fraction of base stock to be increased, improving overall yield. The B-29 Superfortress was powered by the R-3350 engine, which was designed to run on AN-F-33 or 115/145 gasoline. This grade of gasoline was highly alkylated and contained 1.22 parts per thousand by volume of TEL. Gasoline cost about $0.20 per gallon in the United States when war broke out. Its price was controlled thereafter through the mechanism of rationing, which imposed severe limitations on gasoline use on most drivers. There were exceptions for farmers, doctors, and others involved in essential services. Production in the United States reached 30.3 million gallons per day by the end of the war. Rationing was necessary in part because, while gasoline production in the Gulf and Caribbean was ample, the gasoline reached the East Coast by tankers that were vulnerable to U-boats. The logical solution was construction of pipelines from the Gulf to the Northeast, but this was opposed by shipping firms, who pressed for construction of expendable concrete barges instead. The Maritime Commission sponsored construction of such barges, but by the time the barges were ready, the pipeline had been approved and completed, and most of the barges were used as floating warehouses in the Pacific. Rationing was also driven by the rubber shortage, which restricted availability of new tires. 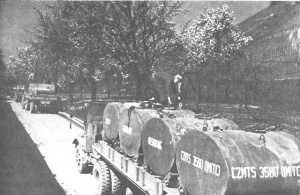 Japanese supplies of gasoline were severely limited and carefully rationed. Lengerer (2015) reports that the Shokakus were equipped with separate fuel systems for two grades of aviation fuel, the higher-octane "A" grade being intended for launch and high-speed maneuvers and the lower-octane "B" grade for cruising, but the split fuel systems required for this scheme on the aircraft themselves are little documented. Towards the end of the war, the Japanese Army began stretching its supply of aviation gasoline by blending it with ethanol (A-Go fuel), even going to the extreme of using edible carbohydrates as fermentation feedstock at the expense of the diet of the civilian population. Handling. Gasoline is a highly volatile flammable liquid whose vapors, when mixed with air in certain proportions, are highly explosive. High-octane gasoline is somewhat less hazardous in this respect. Aircraft carriers, which carried large quantities of aviation gasoline, had extensive fire fighting equipment to control any gasoline fire. Gasoline storage tanks were mechanically isolated from the rest of the ship and given special protection. Sometimes this was supplemented with concrete poured around the tanks, as in the Japanese Zuikaku. The concrete reduced the explosion risk by displacing air around the tanks. American carriers began using carbon dioxide to flush gasoline systems and protect gasoline storage tanks by the time of the Midway campaign. Nevetheless, both sides in the Pacific War lost aircraft carriers when gasoline fumes were allowed to accumulate and were then touched off by a spark, often from an electrical motor.